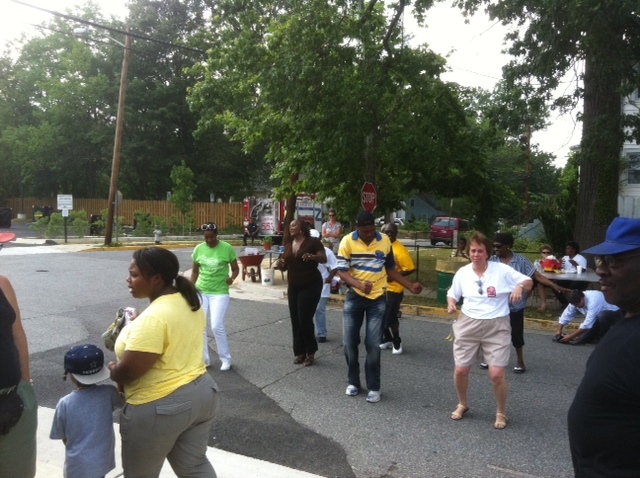 On Saturday June 11, 2011, Acting Fire Chief Marc Bashoor accompanied career and volunteer members from the Bunker Hill Fire/EMS Station #855 to the dedication and ribbon cutting of the Colmar Manor Community Center and Town Hall. Fire/EMS Administrative Aide and former Mayor of Colmar Manor Diane Fennell, who was instrumental in securing funding to build the facility, was also in attendance. The fully modern 3-level facility includes a commercial grade kitchen, meetings facilities, an indoor basketball court and running track as well as Town offices. The facility was constructed with 40 solar roof panels resulting in an approximately 10% savings in utility costs. Today was also the last shift for career Fire Lieutenant Pat McDonald. Serving just over 26 years, Pat is one of the most tenured career employees. He spent this portion of his last shift at the Bunker Hill Fire/EMS Station reminiscing with local officials and interacting with the hundreds of citizens in attendance. Good luck to Pat in all future endeavors. 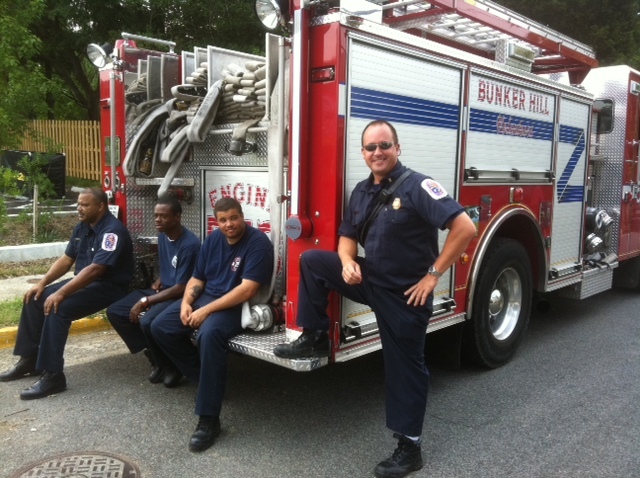 Today was also the last shift for Career Fire Lieutenant Pat McDonald (standing) after 26 years. Acting Fire Chief Marc Bashoor accompanied career and volunteer members from the Bunker Hill Fire/EMS Station #855 to the dedication and ribbon cutting of the Colmar Manor Community Center and Town Hall. Fire/EMS Administrative Aide and former Mayor of Colmar Manor Diane Fennell, who was instrumental in securing funding to build the facility, was also in attendance. 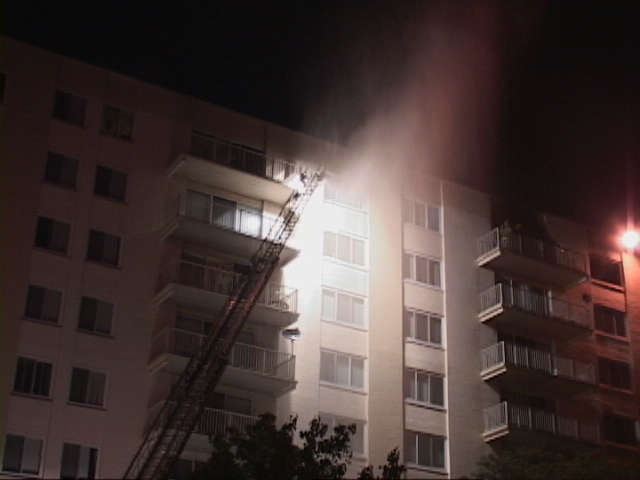 Prince George's County Firefighters fought a fire in a Bladensburg high rise apartment building late Friday night. 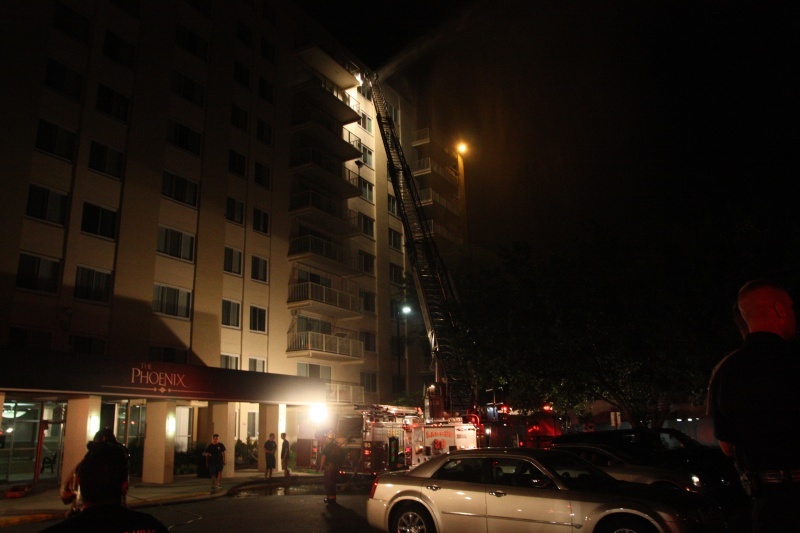 At about 11:40 pm, Friday, June 10, 2011, firefighters from Bladensburg and surrounding communities were alerted to a fire in an apartment on the top floor of 5800 Annapolis Road. This location is a 10-story high rise apartment building; Phoenix Apartments high rise has a total of 150 units. Firefighters arrived to find a working fire on the 10th floor and initiated operations to advance hose lines to the upper floors and evacuate residents from apartments in the immediate area of the fire. 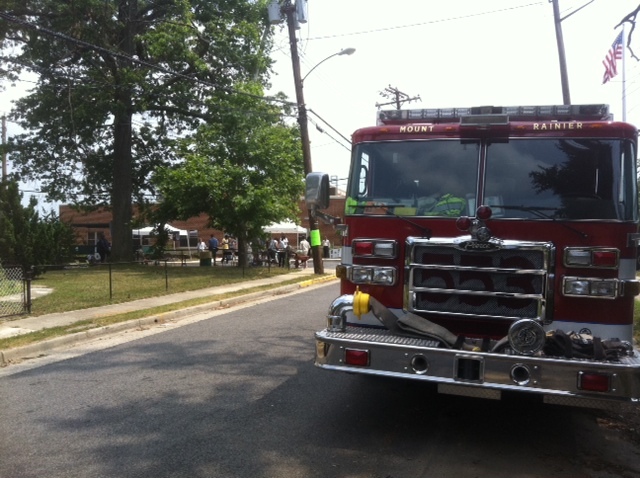 A Second Alarm was sounded bringing additional fire and EMS resources to the scene. Two civilians were evaluated and treated on the scene by paramedics for heat related illness and exhaustion, however, did not go to the hospital. There were about 60 firefighter/medics on the scene that required about 30 minutes to extinguish the fire and check for extension. Firefighters worked well into early Saturday morning with overhaul operations and assisting occupants back into the building. The majority of the damage was contained to the apartment of origin, although, an additional 3 apartments sustained heat, smoke and water damage. Eight families, 14 adults and 2 children, were displaced as a result of the fire. They are receiving assistance from the County Citizens Services Unit and apartment management. Fire Investigators determined the cause of the fire is "accidental" and attributed to unattended cooking. Fire loss is estimated at $85,000. 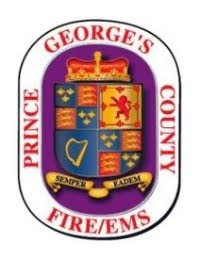 Cooking, most notably "unattended cooking" is the leading cause of fires and fire related injuries in Prince George's County.